Team Milkani Team Kaisendo The Dev Team With Milka And Ido And Friends Whose Lack Of A Proper Name Has Become A Running Joke has released a new game for 2017! 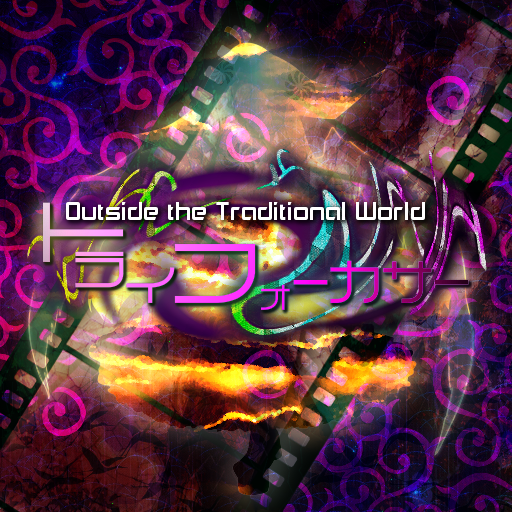 Tri Focuser ~ Outside the Traditional World is a Double Spoiler-style photography game starring the cast of The Last Comer, Mystical Power Plant, Riverbed Soul Saver and Book of Star Mythology. Featuring: playable Aya, Hatate, and Tobiko? I think?? who you can recruit by capturing a particular super-hard card of hers in Level 4, over 100 original spell cards, and an original storyline with a new final boss. Ohh damn, it's out already!? I can't wait to get a chance at playing this! I was under the impression that Team Kaisendokaniknightwhatever would be finishing their collaborative efforts after BoSM, but I am certainly hooked on their further work for however long it lasts! And here I figured BoSM was the end of it, but nope, they've put together their own spin-off, huh? Well, whenever I'm able to pull myself away from Stormblood and Fiesta, I'll be giving this a shot. Anyone else notice that Aya's portrait has the buttons on her waist transparent? Oh man I had no idea a popularity poll was going on! If I did I'd've definitely voted. Least it's glad to know Nezu's gotten 3rd, she's my favorite! Nonetheless, so glad the Team's delivered something for 2017. Not much a fan of the photo games, but this one definitely looks promising. So, our friend the RSS stage 6 death fairy is referred to as "Sacri" in the game's folders and the replay screen. Could that be her name, or is it just some mundane appellation? Also, what does the little intro banner when you start a scene say for her? Dunno what's up with the Sacri thing-- I saw it too in the files just now-- but the intro banner says "Nameless R'lyeh Fairy". This game is incredible, but what's even moreso is that you could make your own scenes with basic danmakufu knowledge. Every photo deals exactly 1000 damage to bosses, and the numbet of photos needed is calculated dynamically. All spell names are under the lib folder in a text file, and are easily modifiable. Well this exists. I wouldn't have known that photo games would be possible in Danmakufu. Looks great. Aya's portrait is awesomely cute, and I love the music so far! So, how exactly is the fourth phase of 5-3 meant to work? I understand the first three phases, but am I supposed to start circling around Riko in the direction which the leek/popsicle/Gluttony Sword is rotating? The other strat I would think of is to Shift+Z slowly to the right, but that gets sort of ruined by the lasers that randomly come from the right side of the screen. Newbie question, but how do you change characters? I'm not quite sure how. That really isn't intuitive. You would expect ESC to exit out of the stage select screen, but it doesn't. I'd imagine it does the same thing as in StB and DS: Locks the current best photo so that it doesn't get overwritten by a better one. Aww cute! One of Shelia's spellcards is a homage to Shining Shooting Star's Final Boss' last spellcard. It's nice when fangames acknowlege each other like that. Anyway another thing I liked is Tobiko as playable, she is fun to use, her viewfinder is larger but she does not focus on the bosses, rather the viewfinder follows your current direction as you move while unfocused, I'm kinda surprised they decided to include BoSM characters, it feels a bit off as they are usually the last characters in a stage. Also does someone know who is the character that appears in stage 4? I think? The one whose spells are about throwing heart danmaku and a parody of cupid. OHH and loved Nezu's first spell where she curses your camera. The fairy with hearts and explosions is Vinkawars. She was paired with Elfin Mint as a midboss in White Names Spoiled Past, which is probably also why she got to appear in this game. On another note, I cleared all scenes with Aya, and yet, Exhibition and Achievement are still not unlocked on the main menu. Has anyone figured out what these do and how to unlock them? Ohh, never actually played WNSP so thats where she comes from. I have to admit I am surprised there are not characters from that game. Are they DLC or something? I mean, will they appear in a future update? I recall seing them unlocked in the demo video that they uploaded on NicoNico. The WNSP cast probably isn't in this game because they're NRT's OCs rather than Milka's. Vinka was one of Milka's OCs prior to her cameo in WNSP, so she's grouped here with the characters from the games Milka wrote. I also think that it would be slightly strange to have the WNiSP cast in this game, but mostly because of the sprite/artstyle difference. So wait... was BoSM actually a Milka game, then? I was under the impression it was made by a separate (though related) group, though now I'm not sure anymore. Edit: Speaking of which, Mace is apparently making another game . Anybody know where that falls...? I'd like to download this game, but I'm having trouble navigating the Japanese download website. Any idea what I'm supposed to do and what links I'm supposed to follow? After that I'm probably going to struggle with Danmakufu, but I'll cross that bridge when I come to it. It's not a full-blown Milka-And-Friends Game (TM), but Milka did write the story and characters by maceknight's request. The page I linked in the OP should have two boxes. The upper box should have the DL password ("TriFocuser") already written in it, but type that in if it's not. In the lower box, type the three-character captcha code displayed on the right. Then press the grey button that says "3818382.zipをダウンロードします。" On the following page, click the blue link near the bottom that says "＜ダウンロードする | click here to start download. ＞" The download should start automatically on the page following that, but if not, click the upper blue link ("こちら"). If you mean the blue image at the bottom of the page, that's an old danmakufu project thing that predated BoSM and never got anywhere. It seems like Mace hasn't updated some parts of the site for a while now. thanks to the magic of adblocker, axfc just looks like a bland grey website. Thanks for the help. And thanks to the magic of adblocker, axfc just looks like a bland grey website. I'm still going to try and avoid it, though.